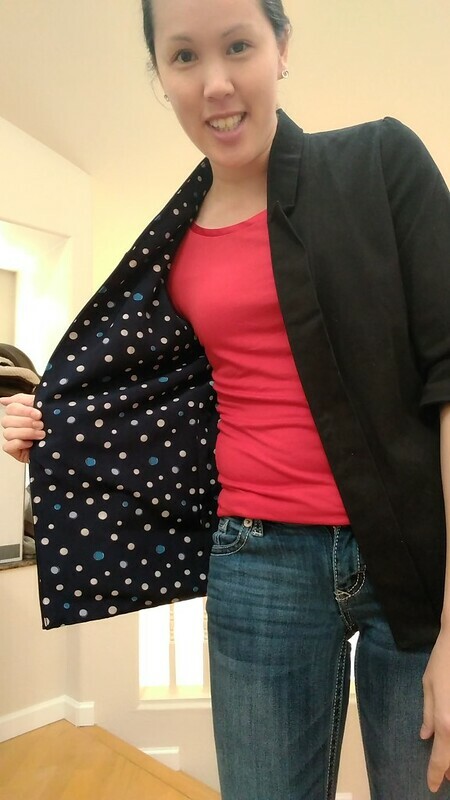 My first By Hand London Victoria Blazer was this denim polka dot one that I really love. Since then, I decided I needed to work a couple more into the rotation. 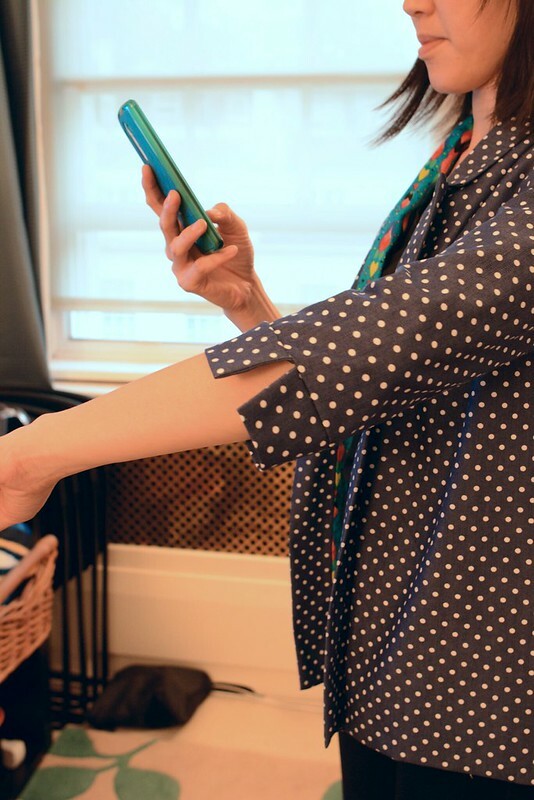 I found these particularly useful for layering when I was pregnant because it has a relaxed fit, and has enough ease to be comfortable through pregnancy weight gain. I’ve gotten plenty of wear out of these whilst not pregnant which is nice. This bright green jersey one is by far my favourite. It’s stretchy and comfy and adds a nice splash of colour which I like to do year-round. The lining is a black and white polka dot cotton that I had in my stash. 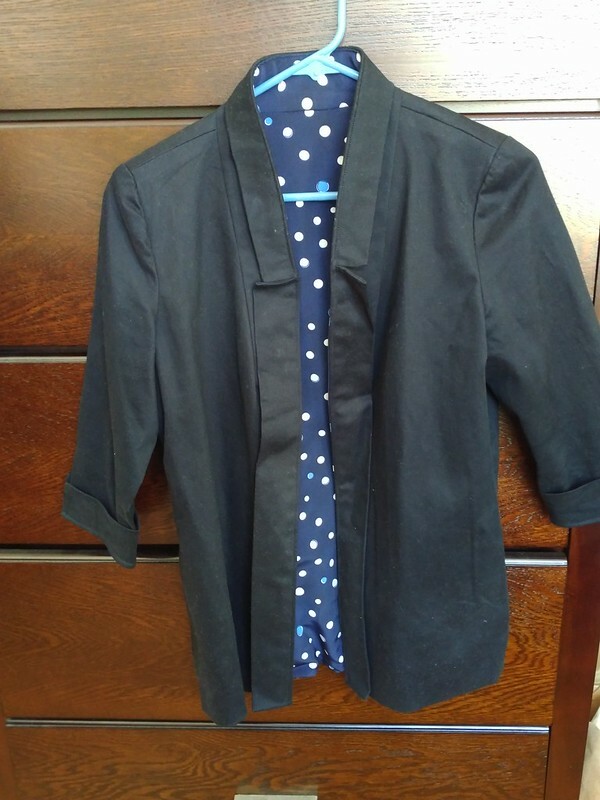 At first I wasn’t sure how I felt about the slouchy lapels (I’d topstitched on my denim version so they’d lay flat) but I then decided that I liked them kind of slouchy and just did a catch stitch on the corners of the collar and top of the lapels. This black version is made of a thick brushed cotton and lined with this polka dot polyester fabric. 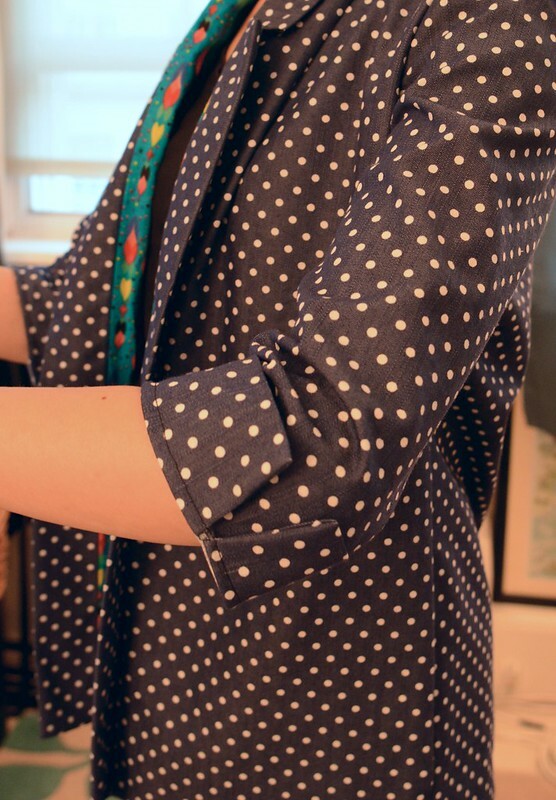 Aaannd, I just realised that I must have a thing for polka dot material! It’s very wearable and a nice stylish basic to wear over and over. The nice thing about the blazer’s looser sleeves is that in colder weather, I can put a long sleeve on underneath to layer. With more wear, I’ve realised that the length of the sleeves is slightly awkward since it hits me right at my elbow bend. Whilst still comfortable, I think I’m going to lengthen the sleeves on my next version. I’m currently debating between a lovely camel melton wool or a twill vest version like Heather’s…or who knows…maybe both! 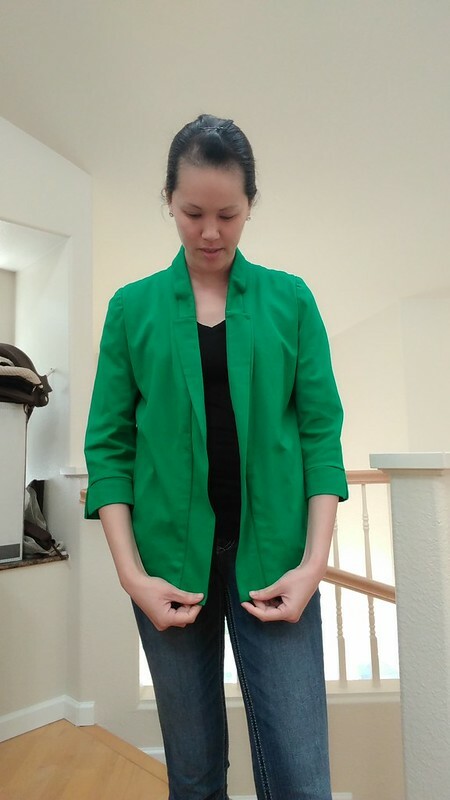 A Victoria Blazer for me! A while back, I purchased a paper version of By Hand London’s Victoria Blazer. I’ve mentioned before that I love their patterns so I figured that even if I didn’t have immediate plans to make it, I would still buy the pattern. It’s ironic that the few paper patterns I own have been the most neglected yet I have completed loads of PDF patterns. PDF patterns need to be printed, a couple of sides trimmed off, taped together, cut out and then traced. It’s a laborious process, but one that ends up being very worth it once done. With the weather getting colder, I thought it’d be nice to make this up. 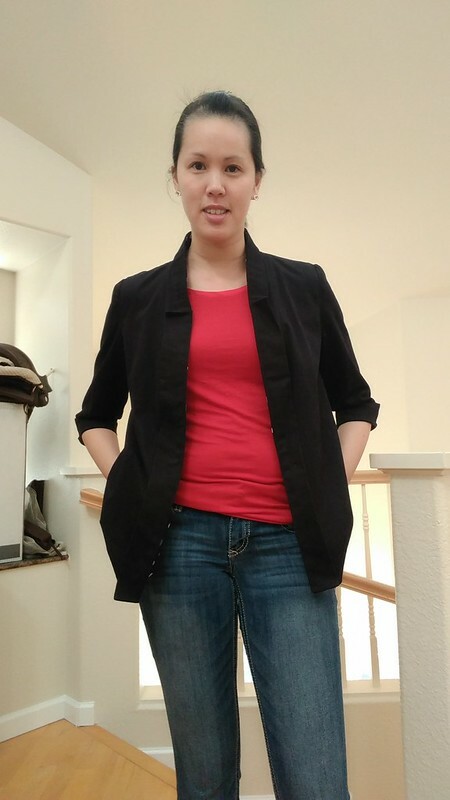 I pondered making it a full long sleeved blazer but decided for the cropped sleeve because it’d be perfect for layering over a long sleeved shirt or turtleneck in the colder months and over a short sleeved tee in the warmer months. The Victoria Blazer is more of a slouchy blazer rather than a structured one. The fit is still really great, but if you’re after a structured pattern, then this may not be for you. I personally love structured clothing. I don’t do oversized or baggy clothing, and all of the blazers I own are very structured. That’s why it surprised me how much I love my Victoria Blazer. 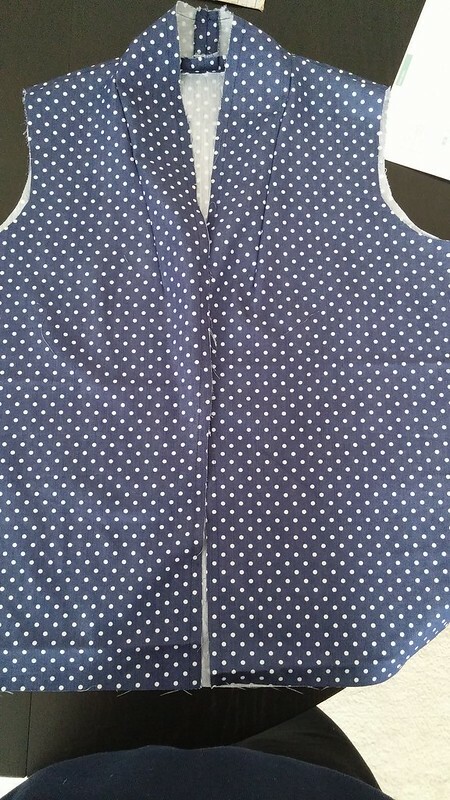 It’s made out of a stretchy denim with white polka dots on it that I bought from the Textile Centre‘s ebay shop. For the lining, I went JAZZY and used the bright blue and patterned fabric I bought in Dubai. 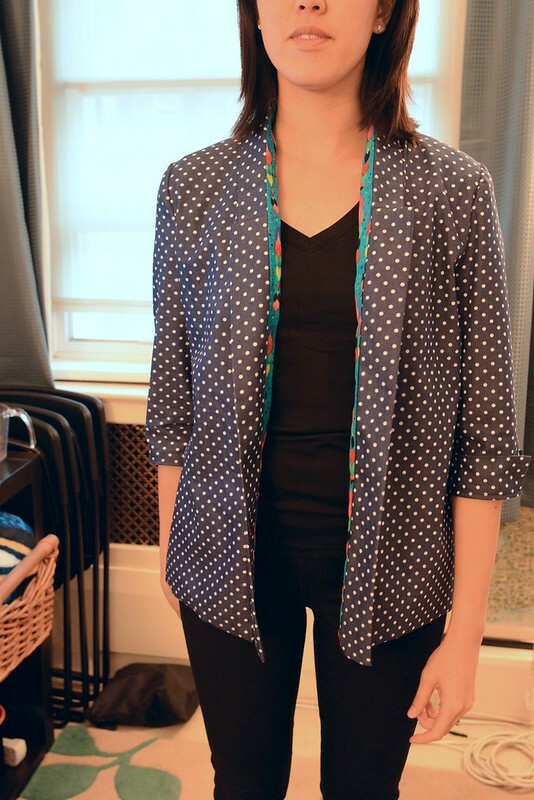 Beth from 110 Creations has a great blog post about tips and tricks for the Victoria Blazer. I didn’t see these until after I created my blazer but will definitely use some of them for my next one which is currently in progress! I’m really happy with how this turned out. 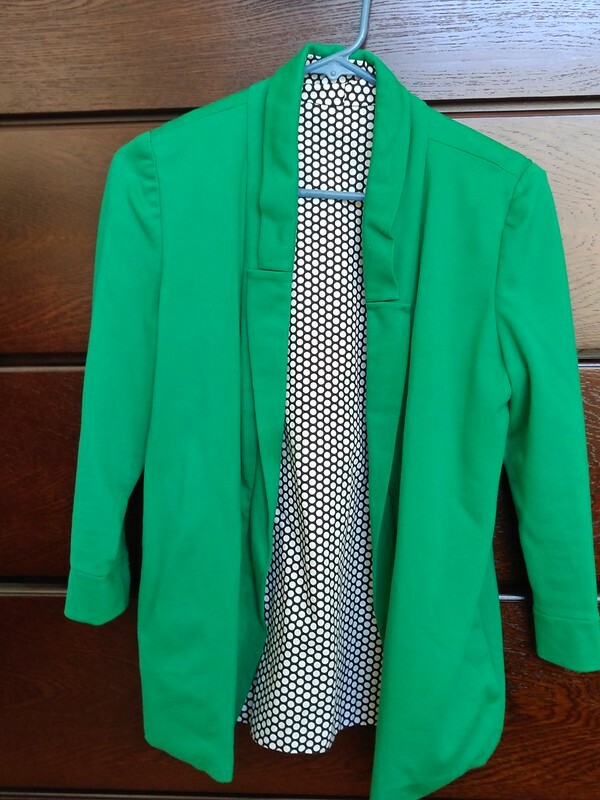 You kind of just follow step-by-step and before you know it…you have a lined blazer! The dart is a bit confusing at first, but I utilised BHL’s sewalong and it worked out just fine. 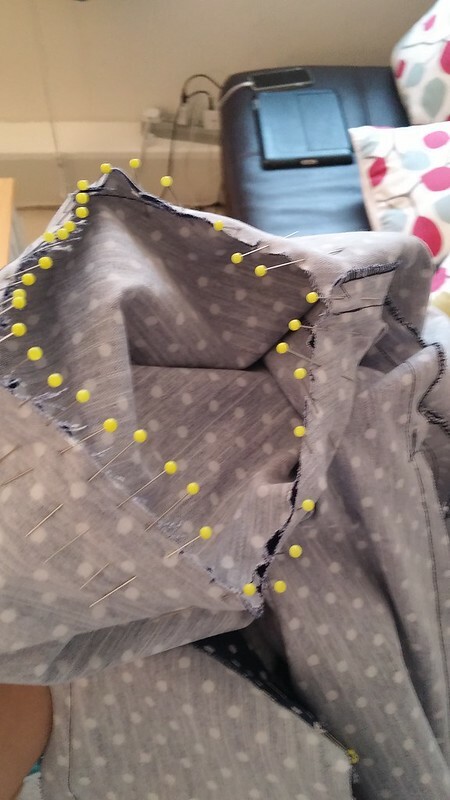 One thing I realised after I’d already started sewing was that I’d missed a couple notch markings on my pattern. I had to go back and mark them on my pattern pieces after I’d already sewn some pieces together…oops. I think I miss those notches a lot easier on the tissue paper patterns when tracing. It was a bit fiddly, but worked out perfectly in the end! After some pondering, I decided to topstitch the lapels and collar down so that they stay in place a bit better. I like the final result even more! I’m obsessed with By Hand London. Their patterns are so pretty and easy to sew. One of the things I love about them are the hacking and separates potential. With their dresses you can mix and match bodices and skirts as well as play with different necklines. I recently made my first Anna dress and it really is so elegant, and simple to sew. I’ve read on blogs everywhere how it’s a “dream to sew up” and they aren’t kidding. 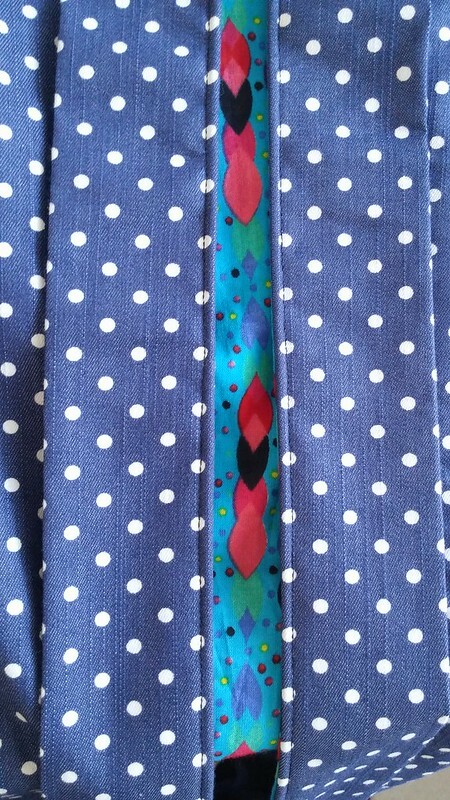 There’s also a pattern hack to add pockets to an Anna skirt…that is on my list of next projects…because let’s face it, who doesn’t love pockets?! A couple weekends ago, I decided to try making an Anna top. 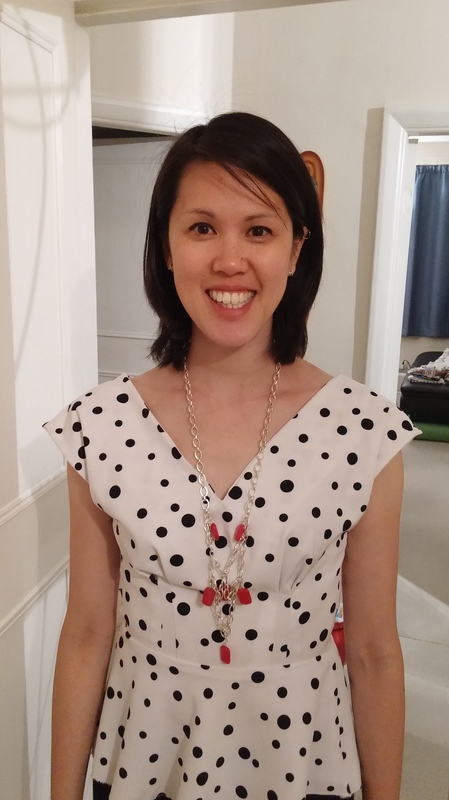 Since the bodice is quite short, and I’m not quite a crop top wearer, I thought I’d add a peplum for the extra length. I used the instructions on Autumn’s blog to figure out the peplum portion. 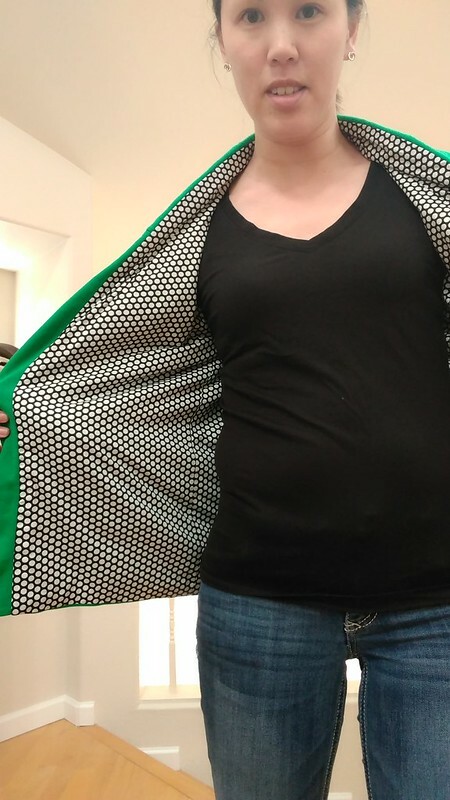 I used this gorgeous black and white polka dot fabric from Minerva Crafts. It’s kind of stretchy but also thick like scuba. I mistakenly overestimated the stretchiness of this because I took out the back seam allowance since I didn’t think I’d need a zip. 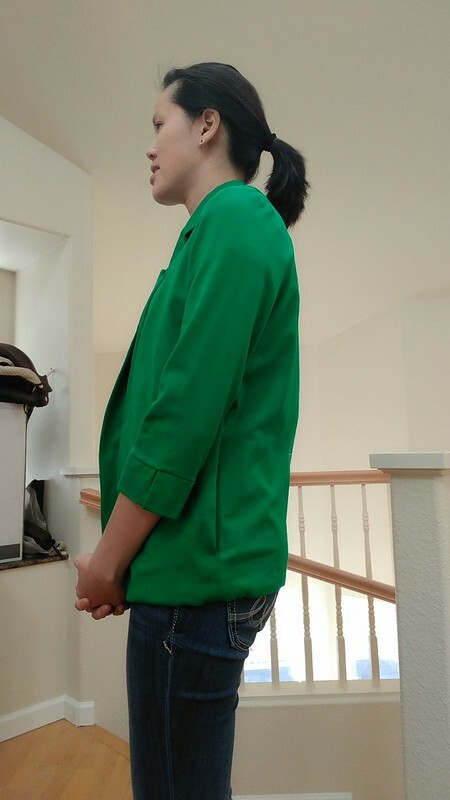 Then, I sewed the peplum on, but tore some stitches in the waist seam trying to pull it over my head. 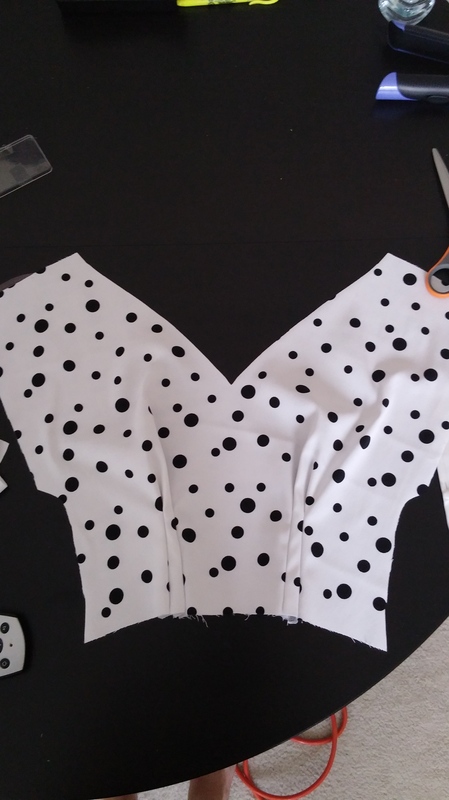 I ended up unpicking the peplum, taking out the darts in the back and then sewed the peplum back to to give me the space I needed. *Phew! I would have been gutted if I’d wasted this gorgeous fabric and all that effort! I haven’t decided whether I want to sew a hem or leave it as is. The material ended up fraying quite a lot so I zig-zagged the raw edge. Since the fabric is quite thick, I’m worried that sewing in a hem will make the edge look to bulky. I wore it to my company summer party unhemmed, and you honestly couldn’t tell. It didn’t fray more either, so I think I’ll leave it as is for now! I think next time I make it, I may put an invisible zip in the side hem and see if that helps. I do miss the back darts as they shape the back nicely. Thankfully, it’s not that noticeable in this version. 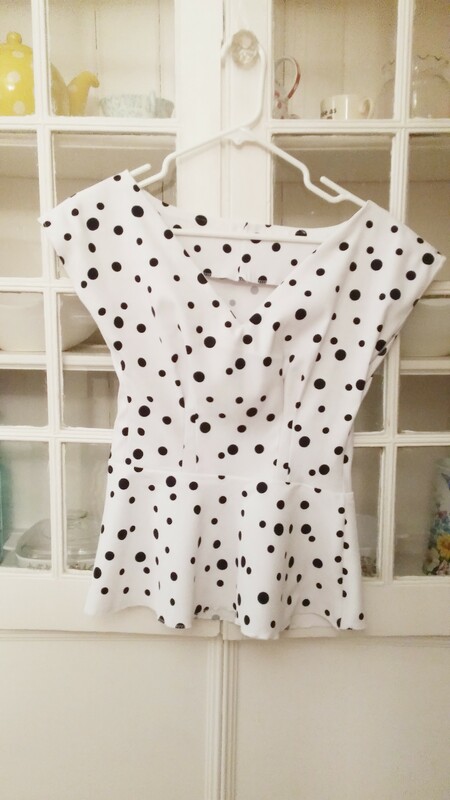 Finished product, with the peplum! I wore it to my company summer party with some black jeggings. It worked out well!